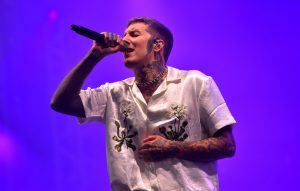 The post Bring Me The Horizon cancel tour dates after Oli Sykes ruptures vocal cord appeared first on NME. Bring Me The Horizon have cancelled their remaining US tour dates after Oli Sykes ruptured his right vocal cord. The band had two dates on their current run left – in Phoenix tonight (February 15) and in Las Vegas tomorrow (16). He continued to explain he had been trying his best to honour their commitments but him singing right now “would be the equivalent of a footballer running on a broken leg.” You can see the full statement above. Bring Me The Horizon appeared on Jimmy Kimmel last night (February 14). As Consequence Of Sound notes, bassist Matt Kean was absent for the performance of ‘Mother Tongue’ and ‘Medicine’. He was replaced by The Fever 333’s Stephen Harrison. The band are due to perform in London on Tuesday (February 19) at a special show for charity War Child. It is currently unclear if the gig will go ahead – NME have contacted representatives for Bring Me The Horizon for comment.